MyPlate is a visual representation of how to incorporate appropriate portion sizes of the five food groups in your meals. It replaced the Food Pyramid in an effort to help consumers better understand how their plates should look, and make healthier decisions. As you can see, the plate is divided into four sections. Looking closely, you can see that vegetables and whole grains take up most of the plate, followed by fruit and protein, with a small quantity of dairy on the side. Designing your plates accordingly will help ensure you are providing your body with the nutrients it needs. 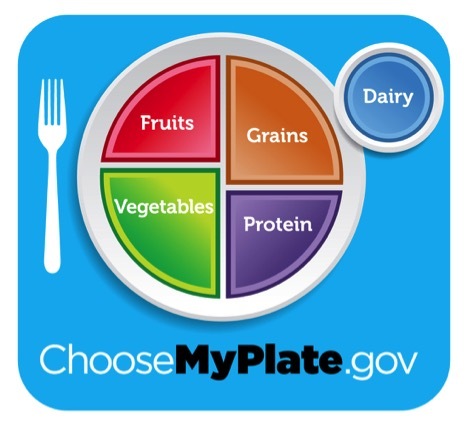 Choosemyplate.gov provides many helpful resources and fun ideas. While browsing, I came across MyPlate, MyWins, an initiative to assist consumers with making healthier decisions through small changes over time in order to help consumers stick with it. Oftentimes, we try to make too many changes too quickly and get overwhelmed causing us to quit or use the phrase “I’ll start tomorrow.” Check out this page for ideas on small changes you can make over time to help you meet your goals!